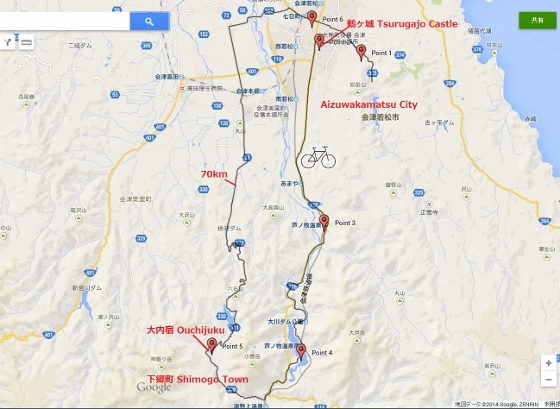 Today I visited Oyakuen Garden and Tsurugajo Castle in Aizuwakamatsu City. 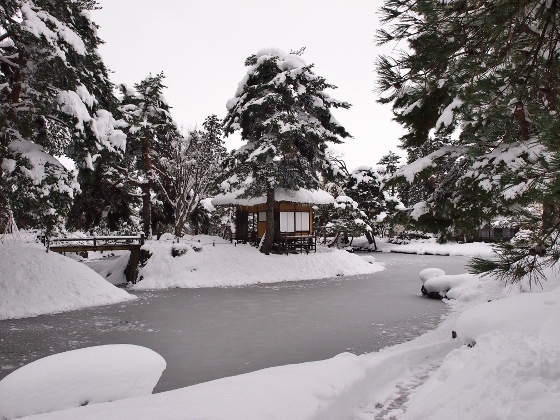 It snowed heavily across Japan and here in Aizuwakamatsu City all were covered with snow. 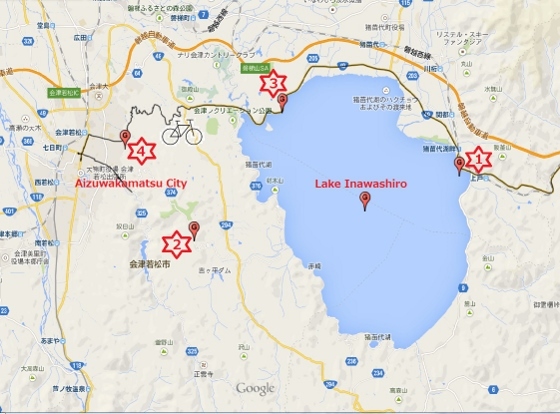 The locations are asterisk 1 and 2 in the map below. I took a city circulation red bus called Akabe as shown above. 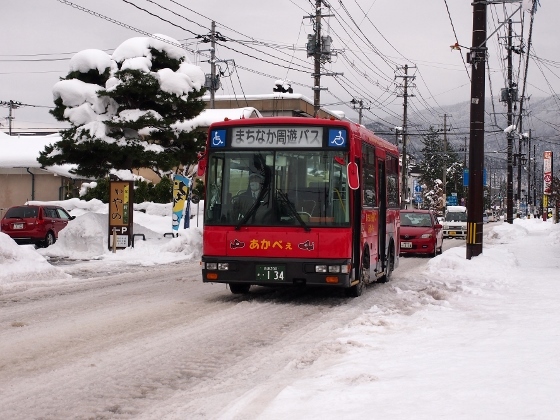 This bus can take you anywhere in the town with only 500 yen a day how many times you ride. First visit was Oyakuen Garden which was designated as the National Scenic Site. 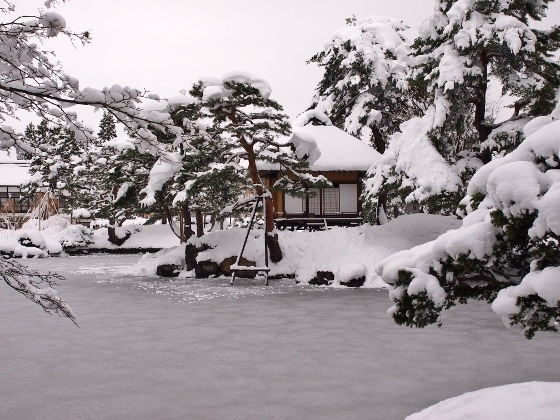 This garden was first built in 1430 by the Aizu Domain Lord Ashina. 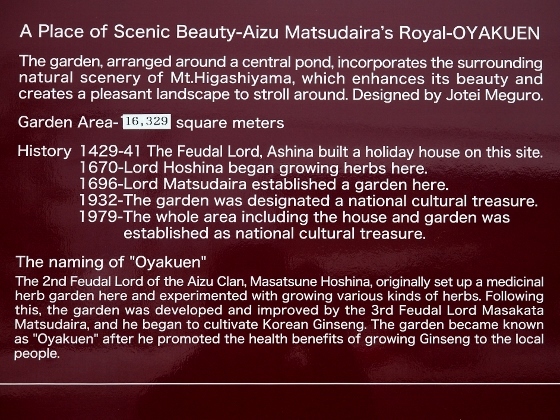 After more than 200 years from then, in 1696 the Lord Matsudaira developed this garden into the current design. Above photos show the explanation and the view. 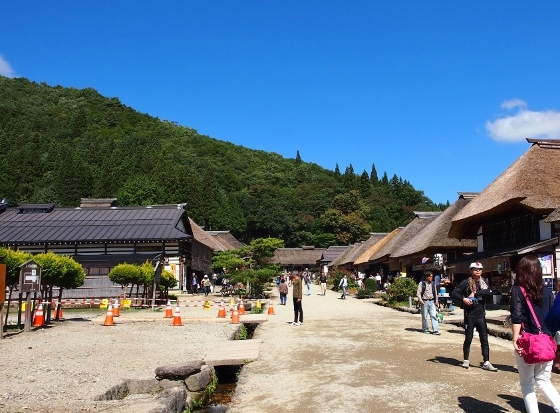 The building in the center is called Rakujutei which was used as teahouse and others. The location is asterisk 1 in the map. 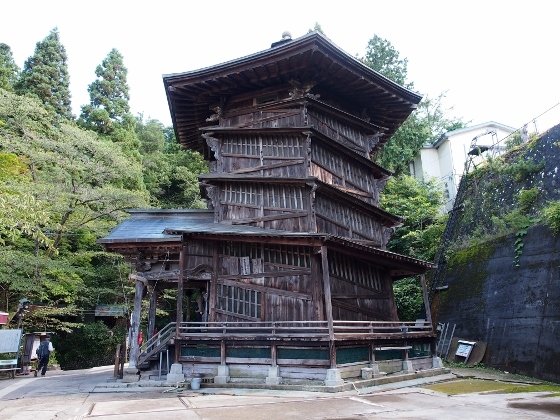 Above photos show the explanation of Rakujutei building and a view from opposite side. Next was Tsurugajo Castle. The location was asterisk 2 in the map. 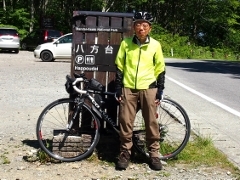 Above photo shows a view from Tsubakizaka Slope side. 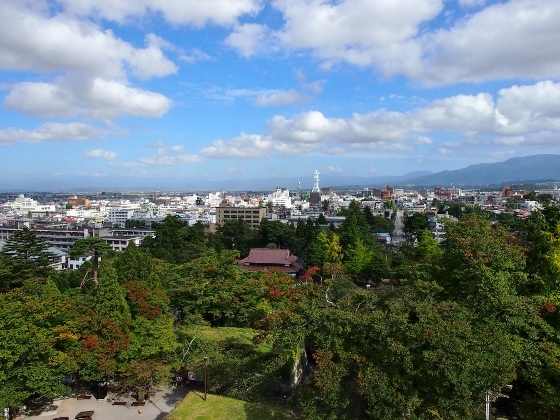 Above photo is a view from opposite side called Honmaru. 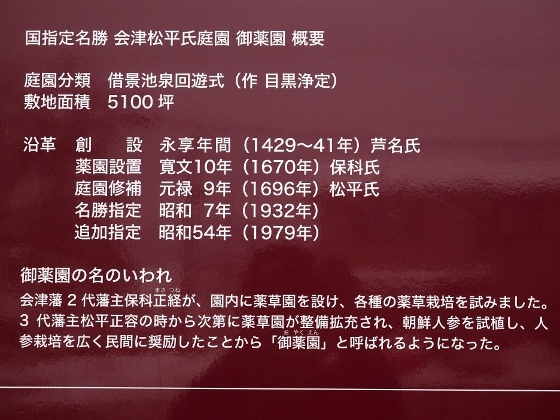 The followings are the brief history of the Tsurugajo Castle. 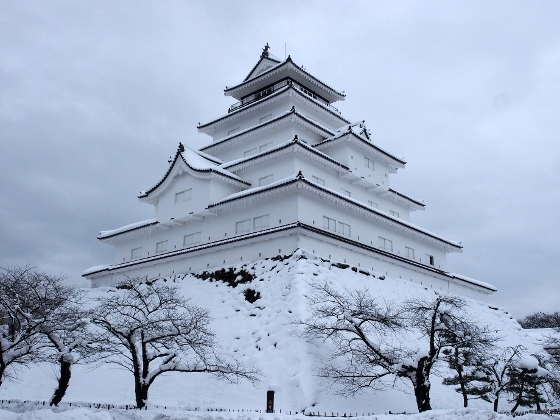 (1) The castle was first built in 1384 by Aizu Domain Lord Naomori Ashina. 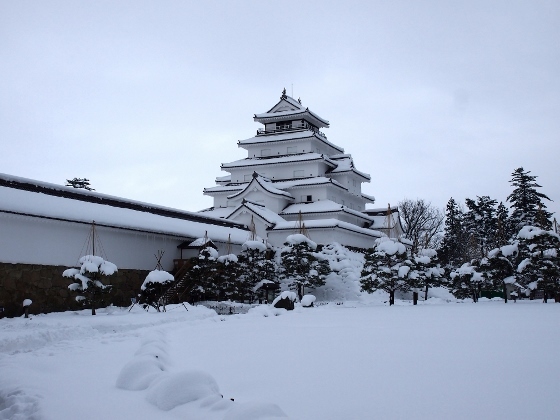 It was called Higashi Kurokawayakata Castle. 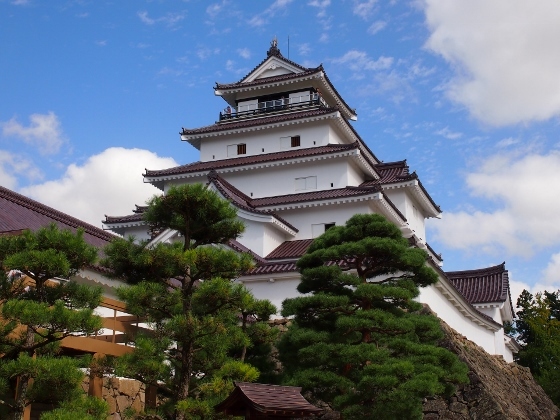 (2) In 1594 Aizu Domain Lord Ujisato Gamo extended the castle into 7 layer structure. (3) In 1611 the castle suffered a big damage by a big earthquake. In 1640 Aizu Domain Lord Yoshiaki Kato repaired and changed this castle to the current 5 layer structure which we can see today. 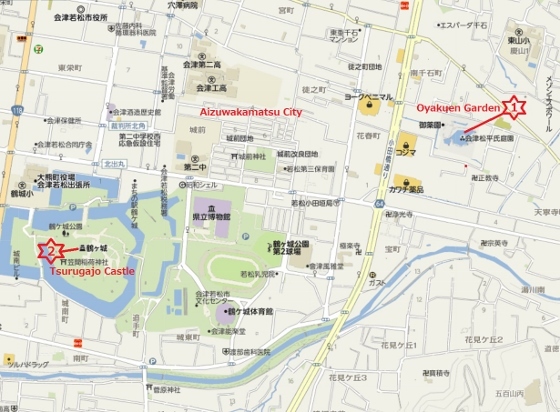 (4) In 1868 the castle suffered a big damage by the Boshin Civil War but did not fall. 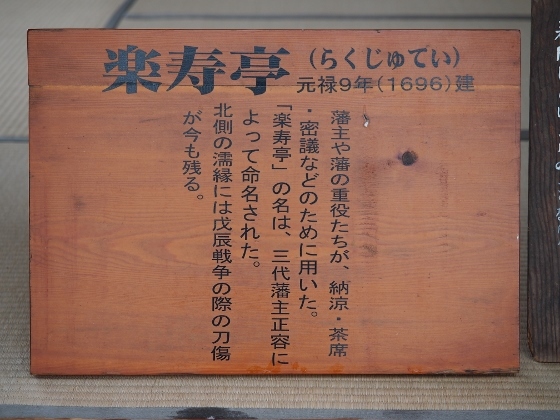 (5) In 1874 the new Meiji government once scrapped the castle. (6) In 1965 the castle was newly rebuilt. 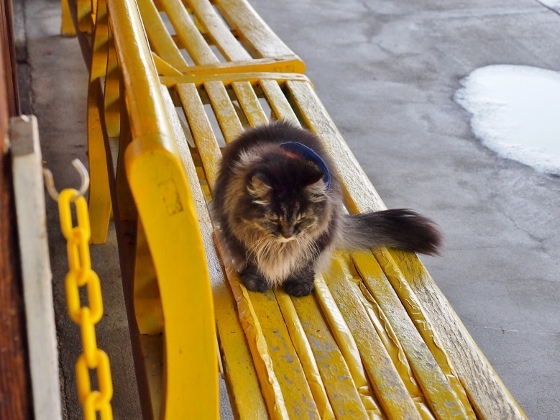 And afterward it was designated as the National Historic Site. (7) In 2011 all the roofing tiles on top of the castle were replaced by red tiles as the same as the old castle. 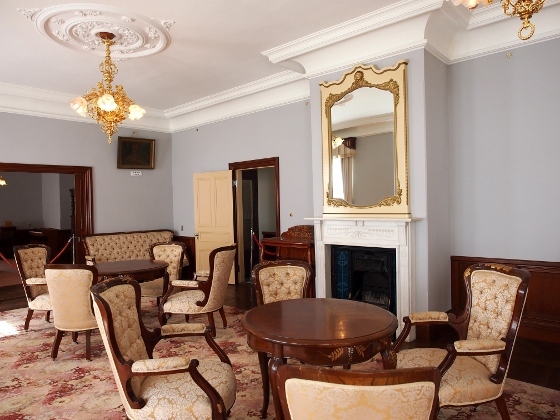 (8) Year 2015 will be 50th anniversary of the new castle. 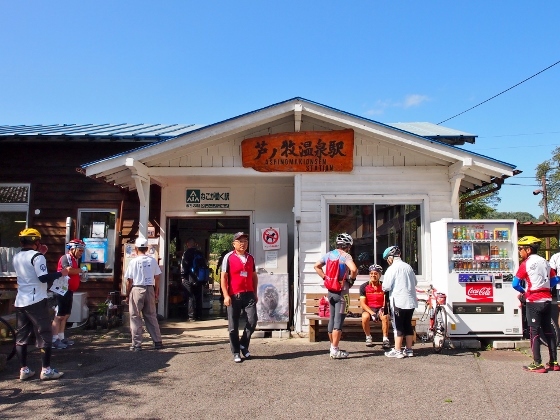 Today, recovering to nice weather after 16th typhoon passed away, I pedaled to Aizuwakamatsu City from Koriyama. 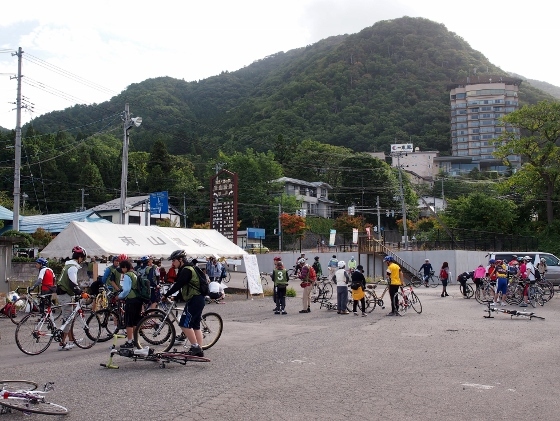 I am going to join in the cycling event in that city tomorrow. 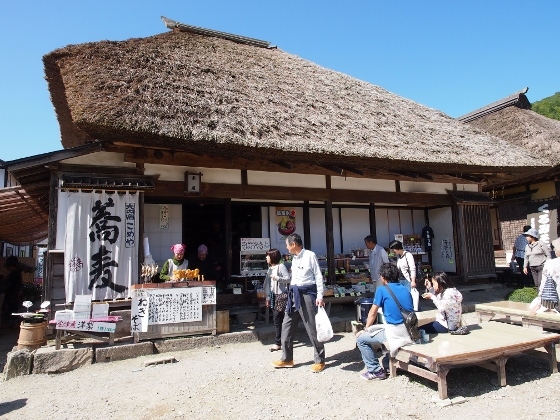 On the way I stopped at Tenkyokaku in Inawashiro Town and Sazaedo Temple in Aizuwakamatsu City both of which had been declared National Important Cultural Properties. 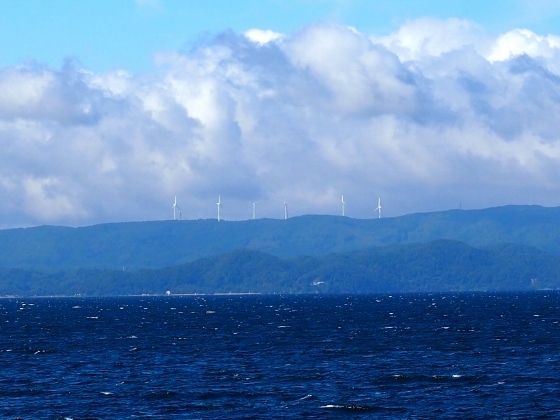 On the way, from the east shore of Lake Inawashiro near Joukohama Beach, I happened to find 7 wind turbines on the mountain of Aizuwakamatsu far ahead as shown above. These are supposed to be wind turbines of Aizuwakamatsu Wind Farm now on construction and are planned to start operation next March. These wind turbines have 2MW of generating power each and as much as 8 turbines are planned. Tenkyokaku Building was built in 1908 as the villa of Imperial Family. It was named Tenkyokaku by Emperor Taisho which meant the villa by the mirror reflecting the sky. Afterwards it was given to Fukushima Pref. 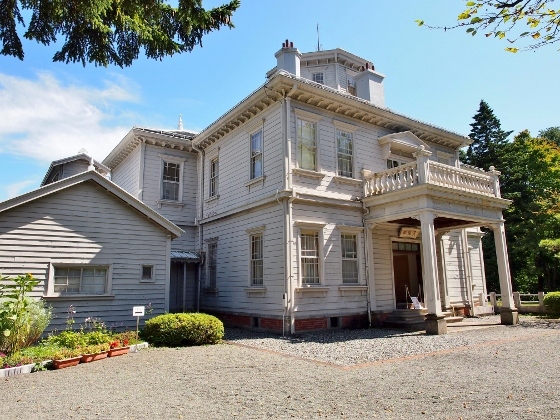 in 1952 and then declared National Important Cultural Property for its splendid western style building of Meiji Period. 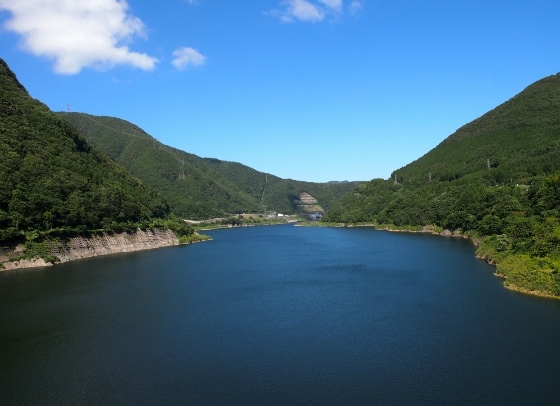 The photo above is the view of Lake Inawashiro from the path up to Tenkyokaku. This view might have been the reason for the name. Though, the swan and the turtle ferry boats in the photo were not there in those times. Above picture shows the main building of Tenkyokaku. Above pictures show the rooms inside Tenkyokaku. 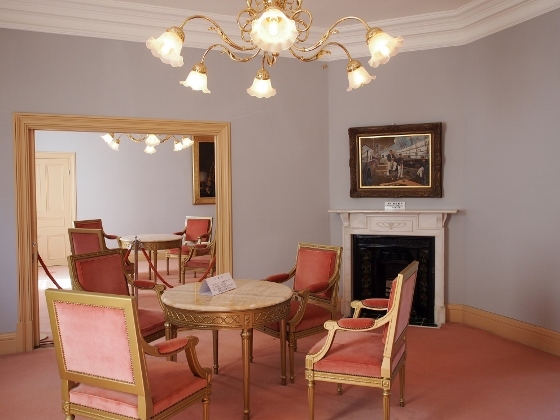 I also found many other nice rooms inside. 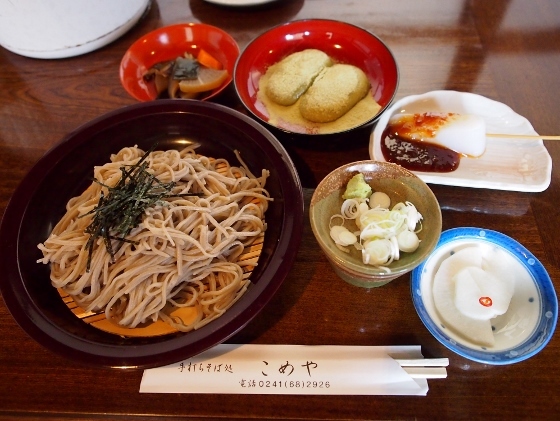 There was a cafeteria at Tenkyokaku. 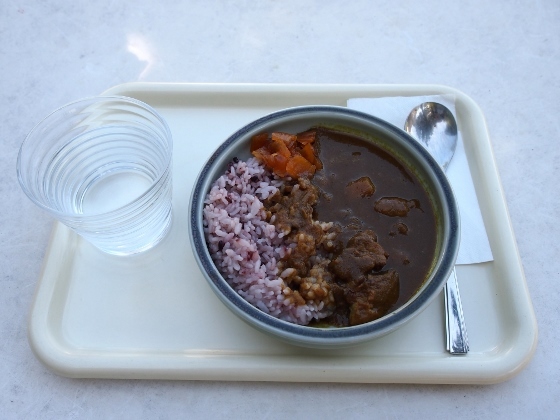 It was just before noon when I visited there and I ordered their original curry dish which was very nice. Next, I visited Sazaedo Temple which stood in the middle of Mt. 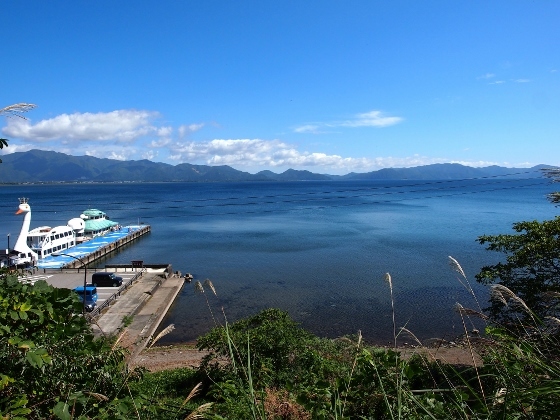 Iimori in Aizuwakamatsu City. It was built in 1796 and has two helical paths for up and down each. People can go up and down without passing each other. Since the building had such unique structure it was declared National Important Cultural Property in 1996. Above photo shows the outside view of Sazaedo Temple. As the photo was taken from the side not from the front, the helical structure can be seen from outside. 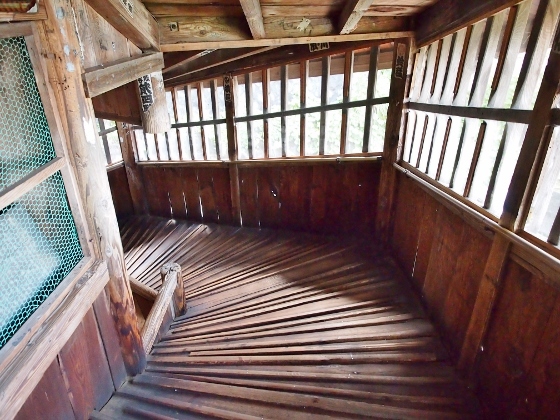 Above photo shows descending path inside the Sazaedo. The path is not stairs. 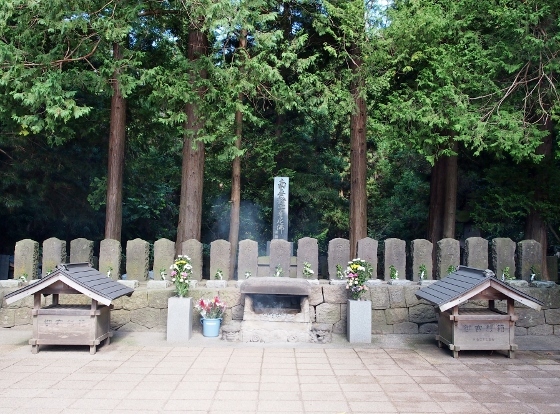 In just a minute walk up from Sazaedo, there were stone tombs of 19 young boy solders called Byakkotai who have committed suiside at Boshin Civil War. The facts of the tragic story were told by the only one boy named Iinuma who came back to life from death.